Vegetated roofs offer several advantages. For example capturing particulates, reducing heat stress in cities, buffering of water during heavy rains and increasing biodiversity. It also offers the enlarging of outdoor living space in cities. Beyond the investors personal benefits there are many communal benefits to green roofs. 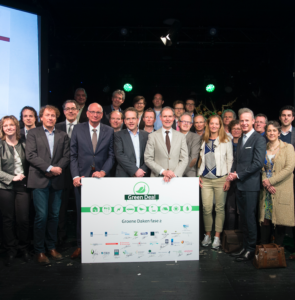 The initiator Leven Op Daken (Living on Roofs) is searching for ways to scale up green roofs together with municipalities, water boards, financial institutions and research institutions. This is done in a Green Deal. At phase 1 (2014 – 2015) we developed new revenu models. In phase 2 (2016 – 2019) we elaborate on the revenu models and experiment in pilot situations. 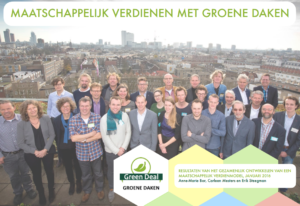 After a pitch at the Ministry of Economic Affairs, Leven op Daken (Living on Roofs) took the initiative to let the opportunities of a Green Deal be investigated. Ministries, municipalities, provinces, water boards and similar organisations were approached for participation in a Green Deal Green Roofs. The result was a plan of action and a concept text for the Green Deal.